Teeds Grove is an unincorporated community in northeastern Clinton County, Iowa, United States. It lies at the intersection of Clinton County Routes E44 and Z50, north of the city of Clinton, the county seat of Clinton County. Its elevation is 692 feet (211 m). Teeds Grove (formerly Teed's Grove, with the apostrophe s) was named after the first settler of Elk River Township. Teeds Grove's post office has a complicated history. Established on 6 January 1873, its name was changed to Teeds on 21 June 1883 and changed back to Teeds Grove on 8 July 1904. The post office was ultimately discontinued on 2 July 1965, when it was attached to the Clinton post office. Although its post office is gone, Teeds Grove retains its own ZIP Code, 52771. ^ a b "Teeds Grove, Iowa". Geographic Names Information System. United States Geological Survey. ^ "Highway and Transportation Map of Clinton County, Iowa" (PDF). Iowa Department of Transportation. 2008-01-01. Retrieved 2009-06-29. ^ Rand McNally. The Road Atlas '08. Chicago: Rand McNally, 2008, p. 39. ^ Wolfe, Patrick B. (1911). Wolfe's History of Clinton County, Iowa, Volume 1. B. F. Bowen. p. 251. 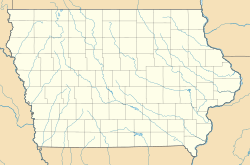 This article about the geography of Clinton County, Iowa is a stub. You can help Wikipedia by expanding it. This page was last edited on 29 April 2018, at 18:03 (UTC).